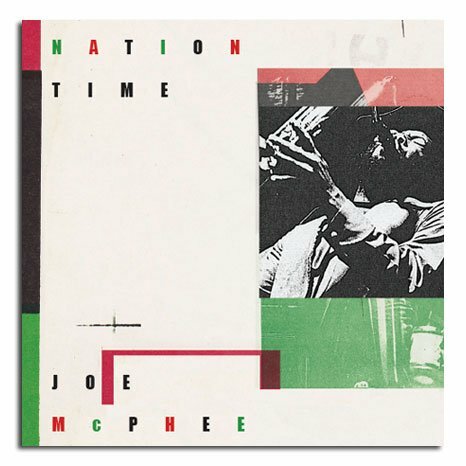 Saxophonist Joe McPhee‘s Nation Time is one of the wildest, most mind-blowing free-jazz-funk monster jams of all time. Recorded on December 12 and 13, 1970 and released the following year on the tiny CjR label, it quickly vanished from sight, but not before establishing McPhee’s reputation as a fierce blower and a man with a unique, forward-looking take on free jazz. Indeed, his music was so ahead of its time that five years later, Werner Uehlinger launched his Hat Hut label with Black Magic Man, an album recorded at the same concert and recording session that yielded Nation Time. Three decades later, when Chicago-based critic John Corbett established the Unheard Music Series to reissue rare avant-jazz titles through Atavistic Records, Nation Time was the first disc to get the treatment. “Shakey Jake”, the second cut, recorded on December 13 with no audience present, expands the lineup to a double quartet, adding alto saxophonist Otis Greene, organist Herbie Lehman and electric guitarist Dave Jones for a sound like a cross between Afrika 70 (Fela’s first major band) and James Brown‘s 1969-1971 JB’s (with Bootsy and Catfish Collins on bass and guitar, and the absolutely crushing drummer John “Jabo” Starks). African rhythms mix with funk guitar and two organs as the music approaches sensory overload. The final piece, “Scorpio’s Dance,” is more traditionally late ’60s free jazz, and might be a little less intense than the first two. But it’s a matter of degree. Black Magic Man, like Nation Time, contains only three tracks, recorded at the same December 12 concert, but the funk side of the group’s sound is mostly absent. This is exploratory free jazz, including several long passages of squealing solo horn. Two pieces—the title track, and “Hymn of the Dragon Kings”—cruise well past the 20-minute mark; the third piece, “Song for Lauren,” is a slow ballad nearly ten minutes long that showcases Kull’s piano. These two albums have been paired in a new boxed set from John Corbett‘s new imprint, Corbett vs. Dempsey. Nation Time: The Complete Recordings (1969-70) is a beautifully packaged four-CD set that includes two entire discs of previously unreleased material—outtakes from the Nation Time/Black Magic Man sessions, and live recordings from 1969 that find the musical ideas of a year later beginning to emerge from a more traditional jazz background. The additional music from December 1970 includes an alternate, shorter version of “Hymn of the Dragon Kings,” and two additional versions of “Song for Lauren” performed by the double quartet (on Black Magic Man, it’s performed by the quintet). The group also performs a raucous deconstruction of James Brown‘s “Cold Sweat” and a version of McCoy Tyner‘s “Contemplation” that makes clear the influence of his playing on Mike Kull, whose piano solos throughout the set are frequently quite Tyner-esque. The 1969 live recordings show an entirely different side of McPhee’s music. He plays trumpet on a lot of it, leaving the tenor saxophone in the hands of Otis Greene; the rhythm section features Tyrone Crabb on bass and Bruce Thompson on percussion, with Ernest Bostic on vibes and no keyboardist. While a club gig—no specific date is listed, just 1969—offers a shortish (only seven minutes), embryonic version of “Nation Time” which begins in medias res, with keyboard and bass solos heard before any horn, and an untitled funk vamp, an October 23 performance at Vassar College, where McPhee was a visiting professor in the Black Studies department, featured mostly standards. The band works out on “Milestones,” “My Funny Valentine,” and “Bag’s Groove,” with the two-minute “Breakaway Theme” the only original. The music is rough and muscular, with McPhee pummeling the melodies into shape; in some ways, it’s reminiscent of how Miles Davis was treating standards at the time—he still had to play them, to keep the audience from fleeing in rage or bafflement or both, but he was using those familiar songs as grappling hooks, to drag listeners into the present day with him. The box’s thick booklet, which includes Nation Time‘s original liner notes and a lengthy interview/conversation between McPhee and Corbett, provides history and context, as well as numerous vintage photos. This set turns one of the most punch-you-in-the-face out jazz albums of the late ’60s and early ’70s into a panoramic documentation of a multifaceted artist at work. It’s easily one of the best boxes of 2013, and crucial for any fan of McPhee’s simultaneously visceral and introspective art.